The B65 Committee is a standards-developing group accredited by the American National Standards Institute (ANSI).It has been in existence since the early 1950's, administered at that time by the National Safety Council and Printing Industries of America. In the early 1970's the committee became inactive for some time and was re-activated and re-accredited by ANSI in 1983, under the administration of APTech (formerly NPES). This part of the B65 series of standards provides safety specifications for the design and construction of new equipment used in prepress systems, printing press systems, binding and finishing systems, converting systems and stand-alone platen presses. This standard is to be used in conjunction with the general requirements given in B65-1. Additional safety requirements are included for the design and construction of new prepress and press equipment, and the auxiliary equipment integrated into the press control system. This standard is intended to be used in conjunction with the general requirements given in B65-1. Additional safety requirements are included for the design and construction of new equipment used to convert printed or blank substrates into cut, folded, collated, assembled, bound, or otherwise finished product. It can also be applicable to processes for preparing substrate for the printing process. This standard is intended to be used in conjunction with the general requirements given in B65-1. Additional press design safety requirements are included for the design and construction of new manually-fed or automatic stand-alone platen press systems intended for diecutting, creasing, embossing, foil stamping and/or printing of paper, board and other materials processed in a similar manner. 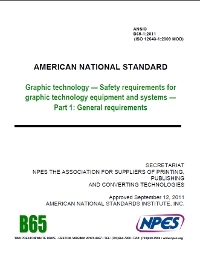 The B65 series of safety standards are published under the title: Graphic technology – Safety requirements for graphic technology equipment and systems. These standards have been revised via national adoptions of the current ISO 12643 series, modified with specific requirements for the U.S. market, which are clearly marked throughout and compiled in separate annexes.